yiannis krikis (thessaloniki, Greece) on 24 January 2008 in Architecture and Portfolio. Beautiful.I hope i will visit before it will tilt even more. Can you go up anymore? Another lovely, gentle photo. Well done. A wonderful shot, Yiannis. It would be so interesting to be up there like those people. Thats a fantastic crop, and brilliant image manipulation. Stunning photo. I love those few people running around near the top. Great post processing too. That vignette works quite well for this photo. Bella!!!!! Anche perche' e' del mio paese!!!!! ottima composizione! Excellent capture and processing. I was at the top when I was 19. Loved the experience. Beautiful shot, post process is just perfect. 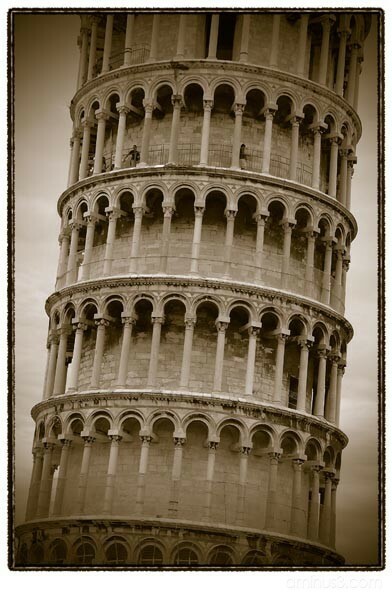 You know, I think that's the best image I've seen of the Leaning Tower. Wonderful crop and I love the sepia tones! Nice multitone treatment. Very nostalgic. Fantastic work here. Lovely processing as well. Iconic! Wonderful image tone and composition.